When dogs are actively hunting on a regular basis, it’s easy for them to keep their senses sharp. They are taking everything that they’ve been taught – in addition to using their natural instincts – and hunting to the best of their abilities. But what happens during the offseason when they aren’t being forced to use their hunting skills week in and week out? Most commonly, their senses and skills diminish, and you will likely notice a reduction in their skills once the next hunting season rolls around. 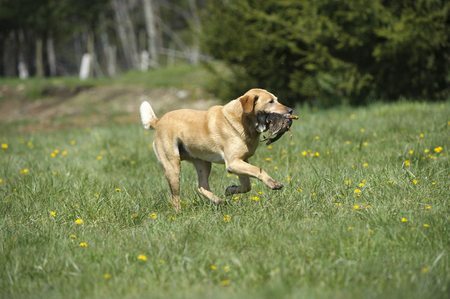 For that reason, it’s important for you to exercise your dog during the offseason so that he or she stays in good shape and keeps their hunting skills sharp for the next season. It’s also important for you to put in the necessary time to continue training your dog. To start, you can use dummies to conduct 20-minute training sessions a few times a week to keep your dog’s senses as sharp as possible. Bass Pro Shops says you should also get into the habit of firing your gun in the vicinity of your dog regularly during the offseason, as well. This allows your dog to become more consistently comfortable with the sound of it firing so that they don’t frighten easily during the next hunting season. You should also continue to use the basic commands that you rely on when you are hunting with your dog. This will ensure that the dog remains obedient to you and understands what is expected of it. While training, stay consistent with the commands and act just as if you were in a live situation. This makes it seem more real and gives your dog more practical experience to rely on and retain come hunting season. As the next season approaches, it’s also important to incorporate scents into the mix along with your dummies. This allows your dog to hone their sense of smell along with their other skills and makes him or her all the more ready for retrieval in the field. If you stay diligent and work with your dog in the offseason, you shouldn’t have any problems once you start hunting again. At KT British Labs, our dogs have been faithful family and hunting companions for countless customers, and if you’re looking to add a new friend or hunting partner to the family, you’ll find them with us. Our British Labradors are healthy, smart and available with a jump start on their training, making it all that much easier for you to put them to work on the hunt. To learn more about our upcoming puppies or our started dogs, call us today at 218-685-5103.